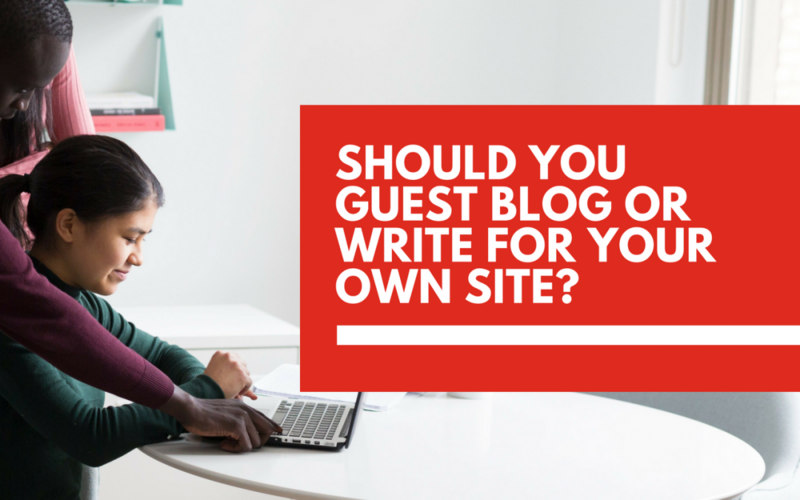 Should You Write Guest Posts or Blog on Your Own Website? As a small business owner, you’ll no doubt be aware of the benefits of content marketing and may even have taken part in some guest blogging in order to boost your website’s authority. But if you’re a one-man band or you don’t have money to pay for someone to write your content, then you may be wondering whether you’re better off writing material for your own blog or focusing on guest blogging to help spread the word about your business and build more links. See also: What are the biggest benefits of guest blogging? The truth is that there’s no right or wrong answer to this question and that every business has different needs. Below, we round up some of the things that you should consider before you decide whether to put all of your efforts into your own blog or spend time blogging on other sites. Perhaps the most important thing to understand before deciding whether to blog for your own site or become a guest blogger is your goals. Is your main purpose to spread information and advice, or do you want your blog to boost your personal brand and help you make more money? If your sole purpose for blogging is to boost your SEO, for example, then you should consider a mix of quality content on your own website and regular guest post slots. If you don’t consider SEO an important part of your strategy (you might be a hyperlocal business that prefers traditional marketing, for example), blogging for your own website will be enough. If SEO is a major part of your strategy and you’ve already taken the time to write high-quality content for your website, like landing pages, resource pages and blog posts, then you could stop blogging on your own website for a couple of months and go full throttle on guest blogging. Something to consider when deciding whether to guest blog is your domain authority. Online marketing company Moz created a search engine ranking score, which predicts how well a site will rank on Google depending on the number of websites linking back to them. It’s now commonly used to determine how authoritative a website is, and predict whether one website will rank ahead of another. Typically, the more links you have, the higher your domain authority will be, and the easier it’ll be to rank for competitive terms on search engines. If your domain authority is low and you’re struggling to get ahead of your competition, then you should consider focusing on a guest blogging strategy. That way, you’ll not only be writing lots of great content that will put your brand in front of new audiences, but you’ll gain more links, too. How often do you write content for your own website? Although there are no rules to how often you should blog, it’s common that small businesses go months without updating their blogs, which looks bad and can lead potential customers to assume that you’ve gone out of business or don’t have the time to write for your own website. Before you start pitching for guest blogging opportunities, you should look after your own blog and make sure you’re keeping it regularly updated before you start writing for other people. In the long-run, writing lots of quality content for your own website will pay off in terms of SEO and audience growth; but if you’re only publishing one blog per month, then it’ll take a long time to build up an audience and encourage them to keep coming back to your website. Something else to consider is time. If you’re writing a guest blog for a website that demands at least 1,000 words and needs rounds of editing before it’s published, that time might be better spent writing content for your own website. Calculate the opportunity costs whenever writing. On the other hand, you might like writing high-quality long-form content for your own website, but have been given lots of opportunities to write smaller articles for other websites. You might decide that you could have six guest posts published (meaning six new links) in the same time it would take for you to write a piece for your own blog, so consider the benefits that way, too. Finding the right balance between blogging on your own website and writing guest posts can be tough, but with the right strategy, you’ll be able to incorporate both into your marketing activities. If you don’t have the time or don’t enjoy writing content, consider the experts here at Muffin Marketing. We offer a range of content marketing and link building plans designed to improve your online presence and help you find new customers. Get in touch today to find out more.